This article is about the Scottish mountaineer. For the businessman, see Andrew Nisbet. Andrew Nisbet (22 May 1953 – 5 February 2019) was a Scottish mountaineer, guide, climbing instructor, and editor of climbing guidebooks. Regarded as a pioneer of mixed rock and ice climbing techniques, he built a 45 year reputation as an innovator by developing over 1,000 new winter climbing routes in Scotland, of which 150 were at Grade V, or above. Nisbet began hill walking in Aberdeen as a youngster, and was the second youngest person at the time to summit all 280 Scottish Munros. Nicknamed "The Honey Monster", he was married to accomplished climber Gillian Elizabeth Nisbet, with whom he established over 40 routes, until her death in 2006. He died at age 65 in 2019 with friend and climbing partner Steve Perry, creating a new winter route on Ben Hope. Nisbet was introduced to hill-walking by his parents whilst still a primary school child in Aberdeen. This activity was further encouraged when he moved to Aberdeen Grammar School in the 1960s. By the time he was nineteen he had climbed all of the Munros (i.e. all c.280 of the Scottish summits over 3,000 ft (914 m)) and was the second youngest person ever to have climbed them all at that time. It was the need to reach the top of the Inaccessible Pinnacle on Skye as one of his last Munros that led to Nesbit's introduction to rock climbing. When he was 20 he went on a rock climbing course and then a winter climbing course at Glenmore Lodge. At this time Nesbit was at the University of Aberdeen where he took a degree in biology, followed by a PhD and then three years of post-doctorate hospital work. He gave up work in 1982 to allow him to spend more time climbing, taking short-term jobs to see him through. In 1985 he went on an expedition to Everest led by Mal Duff. Although the expedition was unsuccessful in its attempt on the north east ridge, it led to an offer of seasonal employment at Glenmore Lodge in both summer 1985 and 1986. He continued to work there as an instructor until 2008. 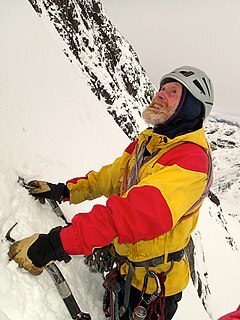 Andy Nisbet has been described as a 'pioneer' of winter climbing because of his development in the 1980s of techniques of using modern ice-climbing equipment to climb steep mixed ground of both rock and ice – a process known as 'torqueing'. This led to a significant jump in overall Scottish winter climbing standards, and one which he personally maintained over the next few decades. Nisbet compiled and edited a number of definitive climbing guidebooks to various regions of the Scottish mountains. He also served a spell as president of the Scottish Mountaineering Club from 2010–2012, as well as serving as the 'new routes editor' for the SMC Journal. Between the 1980s and 2019, Nisbet developed more than a thousand new winter climbing routes in Scotland, and it has been calculated that, of the 600 Scottish winter climbing routes graded at V or more, he was associated with the first ascent of 150 of them,  and that his climbing legacy has surpassed that of 1960's Scottish climber Tom Patey. In recent years, he and his climbing partner, Steve Perry, had been developing many new winter climbing routes on Ben Hope, Britain's most northerly Munro. Vertigo Wall, Creag an Dubh-Loch, Cairngorms (Grade VII, 7) First winter ascent (with aid), December 1977. First free ascent, November 1985. Goliath, Creag an Dubh-Loch, Cairngorms, 1980. The Link Face, Black Spout Pinnacle, Lochnagar. (Grade VII,7) 1988. Blood, Sweat and Frozen Tears, West Central Wall, Benn Eighe, (Grade VIII, 8) 1993. Hot Lips, Garb Choire Mor, Braeriach (Grade VI, 7) 1994. Moss Ghyll, Lower Corrie Lice, Foinaven (Grade IV, 5) February 2003. Bell's Direct Route, Black Pinnacle, Coire Bhrochain, Braeriach (Grade V, 6) 2003. With over 1000 first winter routes to his name, the British Mountaineering Council described Nisbet as "the most active prolific mountaineer that Scotland has ever produced". Between 1989 and 2008, Nisbet was employed by Martin Moran as a mountaineering guide on at least five Himalayan mountaineering expeditions,  and participated in other Himalayan trips which achieved new routes. Nisbet was given the 'Scottish Award for Excellence in Mountain Culture' at the 2014 Fort William Mountain Festival. Climbing partners: Steve Perry and Andy Nisbet on Strapadicktaemi, Creag Dubh, Newtonmore, 2015. Nisbet was killed in a winter mountaineering accident on Scotland's most northerly Munro, Ben Hope, on 5 February 2019. His body, together with that of fellow experienced climber Steve Perry, was recovered by Assynt Mountain Rescue Team from the north-west side of the mountain. They were developing new winter climbing routes on the mountain. They were believed to have completed a new route and were roped together whilst moving across the upper reaches of the mountain. Nisbet was described by one RAF mountain rescue team leader speaking after his death as "the most experienced winter climber of his generation... who had set new standards for mountaineering. Together, the two men had built up a formidable partnership in mapping new climbing routes." ^ a b c d e Latter, Gary (22 May 2013). "60 years of Andy Nisbet". www.ukclimbing.com. Retrieved 8 February 2019. ^ a b Steven, Alasdair (14 February 2019). "Obituary: Andy Nisbet, pioneering mountaineer and instructor in the Highlands". HeraldScotland. Retrieved 19 February 2019. ^ "Climbing pioneer Andy Nisbet dies in Ben Hope climbing accident". Evening Standard. 7 February 2019. Retrieved 9 February 2019. ^ "Tributes paid to 'incredible' mountaineers". BBC News. Retrieved 9 February 2019. ^ "Old Climbers & Bold Climbers: A brief history of northern Cairngorm climbing". www.bbc.co.uk. British Broadcasting Corporation. Retrieved 10 February 2019. ^ a b "Mountain Heritage Trust". www.mountain-heritage.org. Retrieved 9 February 2019. ^ Horne, Marc; Merritt, Mike (8 February 2019). "'Gargantuan and inspiring' mountaineers Andy Nisbet and Steve Perry killed in fall". The Times. ISSN 0140-0460. Retrieved 10 February 2019. ^ a b "Andy Nisbet obituary". The Times. 11 February 2019. ISSN 0140-0460. Retrieved 11 February 2019. ^ "New Routes". www.climbonline.co.uk. Retrieved 11 February 2019. ^ "New Routes 2013" (PDF). Scottish Mountaineering Club. p. 23. Retrieved 10 February 2019. ^ "New Routes 2015" (PDF). Scottish Mountaineering Club. p. 22. Retrieved 10 February 2019. ^ "New Routes 2017" (PDF). Scottish Mountaineering Club. p. 50. Retrieved 10 February 2019. ^ "UK Classic: Vertigo Wall (VII,7), Creag an Dubh-Loch, Cairngorms". www.climber.co.uk. Retrieved 9 February 2019. ^ Nisbet, Andrew (1996). Scottish winter climbs : classic routes from An Teallach to The Cobbler. Anderson, Rab., Scottish Mountaineering Trust., Scottish Mountaineering Club. [Edinburgh]: Scottish Mountaineering Trust. p. 157. ISBN 0907521479. OCLC 34515878. ^ a b Nisbet, Andrew; Anderson, Rab (1996). Scottish Winter Climbs. Glasgow: Scottish Mountaineering Trust. ISBN 0907521479. OCLC 751554337. ^ a b Richardson, Simon. "Scottish Winter Climbing: the last 50 years" (PDF). The Alpine Journal: 154. ^ a b Nisbet, Andrew (2007). Northern Highlands South : rock and ice climbs : including Knoydart, Glen Shiel, Glen Carron, Applecross and Torridon. Williams, D. Noel., Scottish Mountaineering Club., Scottish Mountaineering Trust. [Scotland]: Scottish Mountaineering Trust. ISBN 9780907521976. OCLC 317744455. ^ Richardson, Simon. "Scottish Winter 1993–94" (PDF). The Alpine Journal: 283. Retrieved 10 February 2019. ^ a b Richardson, Simon (2004). "Scottish Winter 2002–2003" (PDF). The Alpine Journal. Retrieved 10 February 2019. ^ a b c "Andy Nisbet and Steve Perry die on Ben Hope". www.thebmc.co.uk. Retrieved 8 February 2019. ^ Moran, Martin (9 February 2019). "Andy Nisbet – unique and irreplaceable". Moran Mountain. Retrieved 10 February 2019. ^ Paul, S.J. (16 July 2015). "New Routes in Unexplored Valleys of Northern India's Himachal Pradesh". Retrieved 10 February 2019. ^ "Two climbers die on Scottish mountain". BBC News. Retrieved 8 February 2019. ^ "In Memoriam" (PDF). The Alpine Journal: 399–400. 2007. Retrieved 8 February 2019. ^ a b Carrell, Severin (7 February 2019). "Tributes to 'incredible mountaineer' who died during Ben Hope climb". The Guardian. ISSN 0261-3077. Retrieved 8 February 2019. ^ "Andy Nisbet, Scottish mountaineer who made an outstanding contribution to the sport – obituary". www.telegraph.co.uk. Retrieved 12 February 2019. ^ "The Mountaineering Scene Mourns the Loss of Andy Nisbet and Steve Perry". The Outdoor Journal. 7 February 2019. Retrieved 8 February 2019.